Last November, my foi Manju aunty invited us to her place just for a change of atmosphere. We all were going through a difficult time after the loss of my mum. Fortunately for me we decided to visit her on Ekadashi day.Unfortunate for my sister in law Heni, as she had to make dishes with potatoes and more potatoes. On Ekadashi fasting which comes every 15 days, one is not allowed to consume grains and pulses and any vegetable that falls under the pulses category like peas, beans, brinjals etc. There are not many options left except for potatoes, sweet potatoes, cassava, yam etc. We were suppose to have lunch at her place. There are not many options to make an ekadashi meal as everything is just full of carbohydrates. However, innovative Heni did come up with some very yummy theplas along with the usual ekadashi fare. 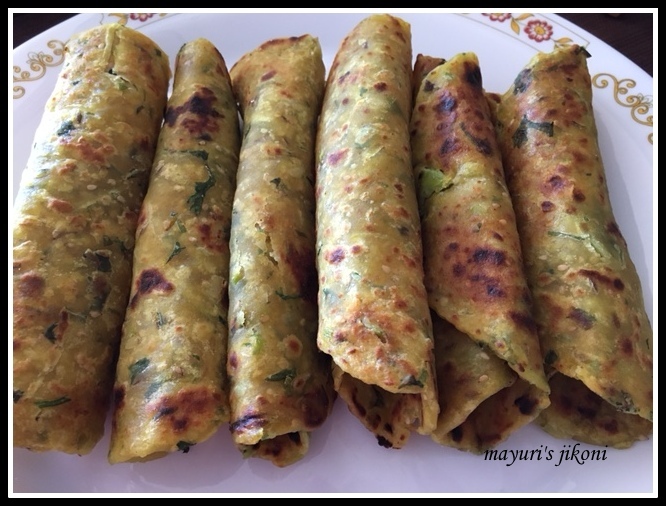 They were not greasy at all, very soft and tasted delicious.If any of you have made rajgira puri you know what I am talking about. The theplas were made from farari or ekadashi atta which is readily available in the Indian stores in the western countries and in India. But, not all parts of India as not everyone does Ekadashi. We enjoyed the theplas with some potato curry. During my visit to India I mentioned to my mother in law Nunu about the farari theplas. Nunu made sure I came back to Mombasa with enough of the farari flour. Heni, thanks for teaching me how to make the theplas. I have made a slight variation and of course actually measured out all the ingredients for the rest of the Patel clan and their friends. Most Ekadashi flours are made by mixing rajgira flour(amaranth), sama flour (moriyo, barnyard millet, varai, bhangar), sabudana flour (sago, tapioca). Some add buckwheat too. So this flour is gluten free. Though I made these for Ekadashi, you can make them for any fasting day which does not allow you to consume grains and pulses. Put the flour in a large mixing bowl. Add to it the 2 tbsps of oil, cumin seeds, turmeric powder, chilli and ginger paste, salt and sesame seeds. Mix well. Add the mashed potato, grated doodhi and fresh coriander to the flour and mix well. Add the yogurt and knead the dough. Grease your hands with oil and divide the dough into 12 parts. Roll each part into a ball. Roll out the ball into a circle using the extra flour.Approximately 6 inches in diameter. Put the rolled thepla onto a preheated tawa. Make sure the tawa or frying pan is not too hot. Using medium heat cook the thepla on both sides slightly. Add oil all round the edges of the thepla and cook further till brown specks appear on each side. Serve them with yogurt or chundo or potato tomato shaak or sabji. Instead of doodhi add grated paneer. They taste equally good. Instead of doodhi can add grated cabbage. After kneading the dough, do not leave it for too long as it may get softer and make rolling the theplas out a bit difficult.